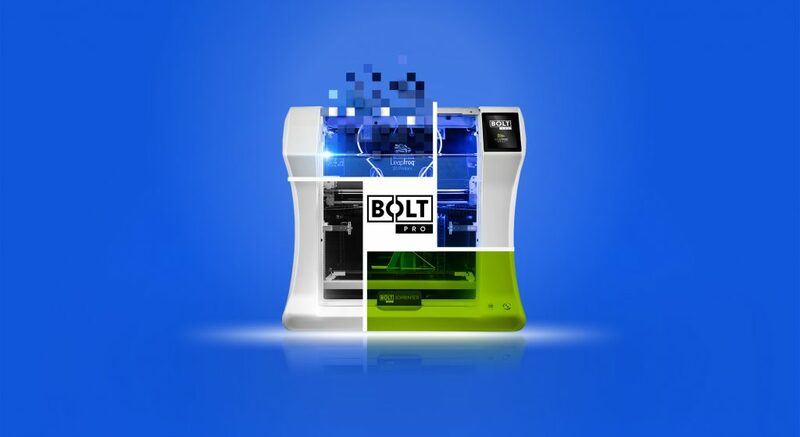 The Bolt is an advancement in the technology of 3D printing that uses multiple materials in parallel. 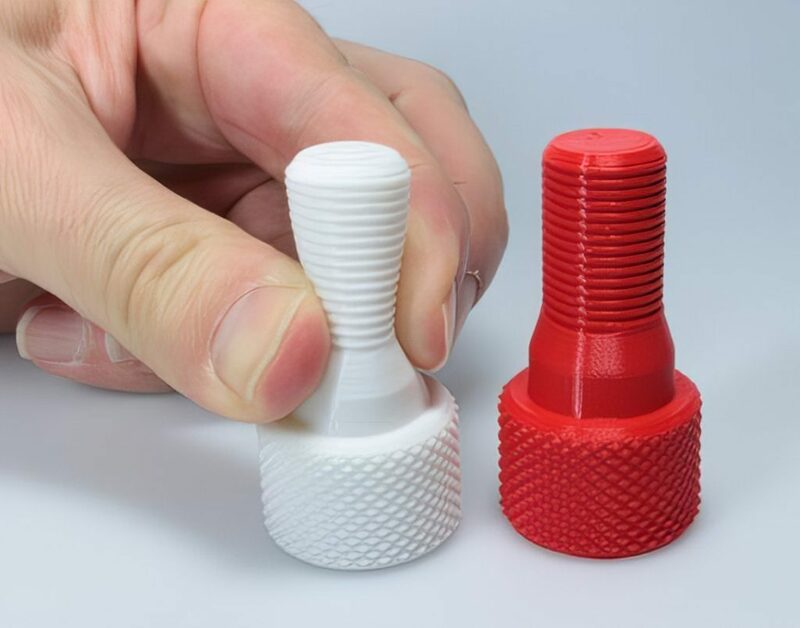 Manufacturer Leapfrog has developed its own method to take away the unused nozzle when printing with multiple materials. 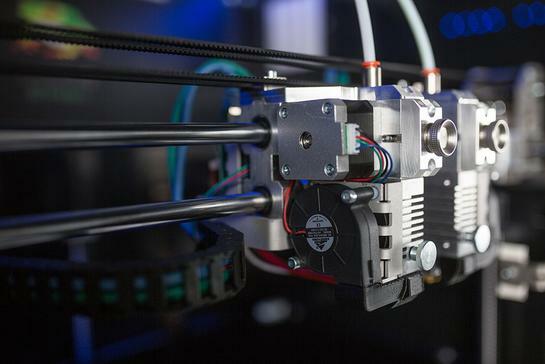 Admittedly, a 3D printer of 6000 Euro’s exceeds the typical test range of the Make-redaction. 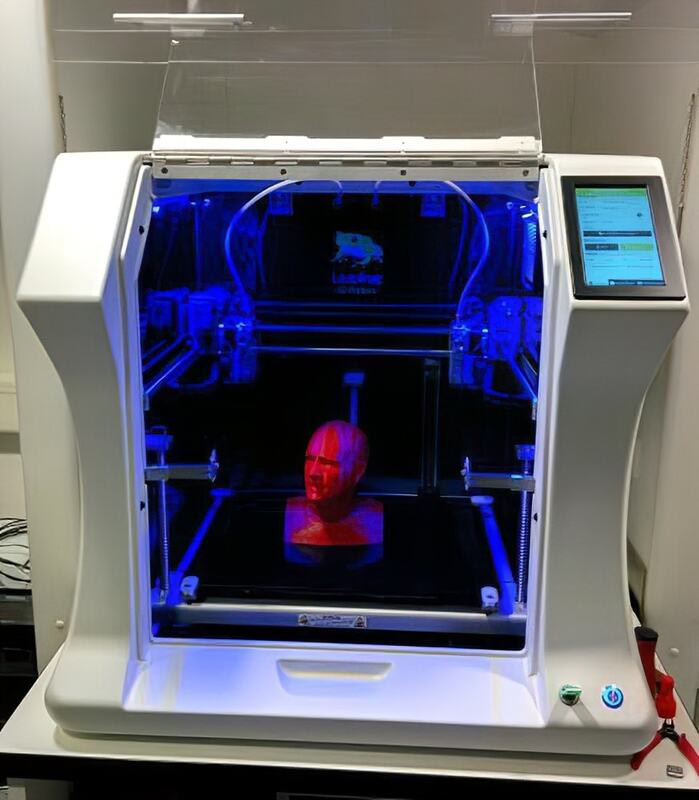 That is why few FabLabs will invest in such an expensive machine – let alone private users. The fact that we did try the Leapfrog Bolt has two reasons. On one hand, they developed their very own technique for the machine in order to fix the issue of printing with two materials in parallel. On the other hand, we repeatedly test the Creatr HR and monitor the company and its developments. The Leapfrog Bolt has a completely enclosed casing. This way, the heat from the heated print bed and the extruders gets outside. An activated carbon filter protects against poisonous fumes, which may arise for instance when printing with ABS. One thing was clear in the test. You cannot operate larger machines than these because they simply do not fit in the test room they have. Despite its large interior space, the maximum object size for work pieces at the Bolt is smaller than it may seem at first glance: the height is limited to 20.5 cm; The red bust takes full advantage of this height. The filament leads also need a good piece of height. The best demo object is this bolt – the right one from red PLA, left of flexible material. 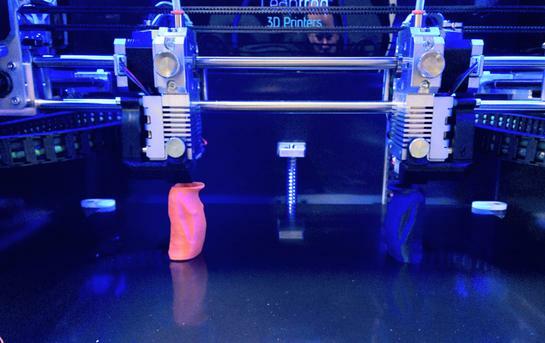 You can print both of thse in sync mode, in one go: each of the print heads prints one piece on one half of the bed. … and it is sufficient to prepare a single print file and then select the appropriate mode on the display on the printer. Instead of a mirrored copy, the change to the sync mode for a non-mirrored character would have been possible with a single touch. The two print heads can, of course, work alternating on an object. 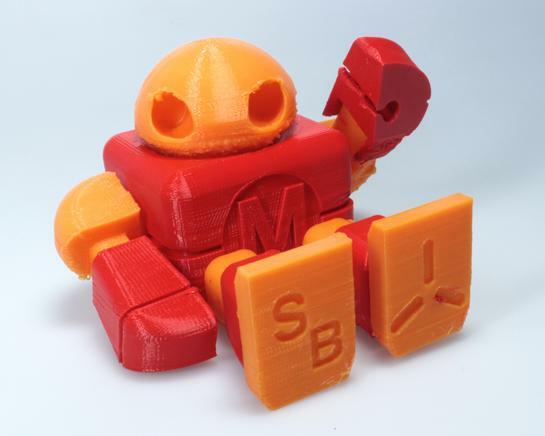 In this mobile robot, the red parts are made from Leapfrog PLA while the orange colors are printed from the filament of Avistron. The video shows how the head changes between the two materials. The two heads sit on common axes, but separate belts drive them. The Y and Z positions of both are therefore identical for both, in the X direction they are independent. The Leapfrog Bolt is fully network-capable with WLAN access, thanks to a Raspberry 3 under the hood. It automatically obtains firmware updates through the network. Using a built-in camera, you can keep track of the progress of long prints and stop the machine from afar in the event of an incident. In order to be able to test the machine at all, the c’t editors kindly let us into their printer test lab, but also there we nearly exceeded the size of the test booths: the Bolt measures 72.3 cm × 83.1 cm × 80.1 on the outside; the device weighs more than 60 kilos and could only be lifted on the table with combined forces. You can comfortably access the machine via large touch screen. Inside is a Raspberry Pi 3, which also brings WLAN. An update during the test period came automatically via LAN connection to the device. It updates by itself and there is no need for you to connect anything to the computer. You can handle all maintenance procedures as well as material changes by only using your finger tips. There is a possibility to translate the interface to another language (German for example) after the automatic update. The big problem with conventional dual-head printers that combine two extruders in one unit is that the inactive nozzle often scratches directly over the freshly melted material layer from the other nozzle and damages it. If you have a lot of bad luck, the painstakingly created object is detached from the platform and the print fails – unfortunately, this is common in many older double head printers. We have also experienced this with the Bolt’s predecessor, the Creatr HS. We have recently tested one way around this problem on the Ultimaker 3: this unit drives the unused nozzle a bit higher than the one currently active, which worked well in practice. Leapfrog, on the other hand, has come up with a different idea: the two extruders are located in structurally separate print heads, which only move on a common X-axis. Your Y position is always the same, but the unused print head can be moved to the side and is completely out of the way. Sync: The two heads move parallel and print two identical copies of the work piece on each half of the construction platform. You can request to make the prints out of different materials. Mirror: Like Sync, except that one of the objects is mirrored. This mode can be useful when printing symmetrically designed housings in multiple parts. Dual Extrusion: Combining two materials in a single work piece. In each layer of the 3D model, the first head prints its part of the work piece, then a change takes place, and the other prints its part. This way many combinations are possible; for example, two-colored parts or components consisting of multiple materials with different properties such as rigid and flexible parts. For the Sync and Mirror modes, by the way, it is enough to place the work piece on the right side of the construction platform during the print preparation in the software. 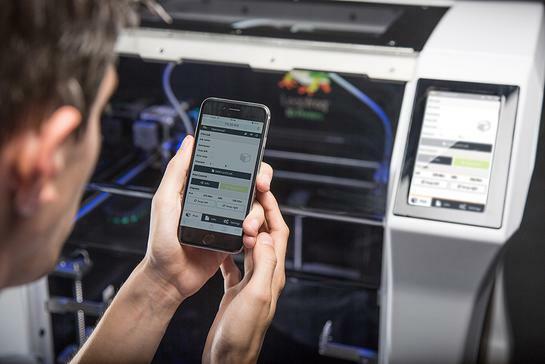 Therefore you can simply select one of the two copy modes directly on the touch display on the printer. The video shows that in dual extrusion the change between the heads takes place in a few moments, resulting in only a minimal delay. The freshly activated nozzle is wiped off and the start printing immediately on the work piece; intermittent printing of an auxiliary structure as with the Ultimaker 3 is not needed. With this setup, the Bolt succeeded in producing clean prints made of several materials. Just like with the Ultimaker 3 in this respect, Leapfrog’s approach to dual-extrusion printing works well. The Bolt is a powerful device with industrial mechanics and proved to be easy to use in the test. The dual extrusion mode works well, thanks to the enclosed installation space, the heat output of the extruders (up to 360 degrees Celsius) and the construction platform (up to 90 degrees Celsius), the machine is suitable for a wide range of materials. 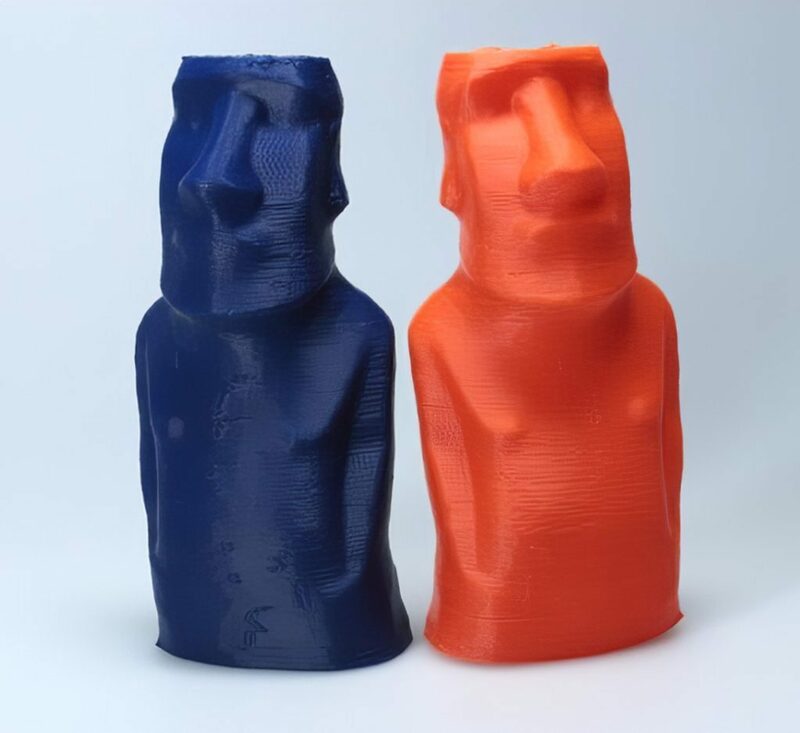 Among other things, it should also be possible to print a work piece made of ordinary plastic and to support its overhangs with the water-soluble material PVA, which is washed away afterwards – for reasons of time we have not tried this ourselves. This was a translation of the original German version of MAKE’s Bolt review which can be found here.